Meet Westboro’s Diana Potvin, a volunteer with the Carefor Health and Community Services Carling Adult Day Program. Photos by Judith van Berkom. Diana Potvin has been volunteering two days a week at the Carefor Carling Adult Day Program for the past seven years. Carefor Health and Community Services Carling Adult Day Program is a charitable, non-profit organization, which provides a variety of health and homecare services across the Champlain district. At the Carling location, the Dementia Care Program is offered six days a week. Three days a week, the Seniors’ in Recovery from Mental Illness Program gives seniors in the community the opportunity to socialize with each other in a supportive environment. Native to Ottawa, Potvin grew up in Britannia and remembers watching the horse and wagon take dancers up to the Ranch House at Lakeside Gardens for bean supper. She raised two children in Britannia and moved to Westboro five years ago when she retired. Her niece, Tracy, worked as a personal support worker with Carefor, and recommended Potvin volunteer. Walking in the door at Carefor’s adult day program on Carling Avenue, one is immediately struck by the feeling of happiness. Staff greet clients by first name and thank them for coming when they leave. The place is filled with laughter. Marie has been given the nickname “my little sweetpea,” by Potvin, who describes Marie as a quiet woman with a soft-spoken voice who has been attending the day program once a week for the past year. The staff and volunteer ratio to client is four to one. Potvin works where she is needed – cleaning up in the kitchen after lunch, passing out snacks mid-morning, or playing a game of crokinole with a small group of clients in the afternoon. She likes being involved with people and says that her “heart feels good” at the end of a day spent there. Carefor Carling staff and volunteers from left to right: Fatima Gure, Natalie Harrison, Laura Peters, Meghan Kenny, Shirley Geurkink, Diana Potvin. The adult day program provides respite to caregivers whose spouse or parent is being cared for at home, or provides a day away for clients who live in senior residences in the city. Staff and volunteers engage with their clients from the moment they arrive in the morning. A volunteer greets clients and their caregivers as they arrive, and provides assistance where needed until mid afternoon, when caregivers or Paratranspo take clients home. Carefor’s mandate is to “give clients a safe and caring environment that promotes a sense of accomplishment and encourages self-esteem.” Recently, Carefor hired a consultant to train staff in ‘Arts Reminiscence and Life Story work’ for older adults living with dementia. “She has good skills in developing rapport with people; people are immediately comfortable with Diana,” says Conway. Criteria for becoming a volunteer at Carefor include an interest in working with people with dementia, an eagerness to learn, being kind, patient and flexible. Potvin’s colleague and the head of volunteers, Natalie Harrison, says Potvin is definitely all of these and also very charismatic, with a great sense of humour. “She responds to the needs of clients – anticipates their needs,” adds Harrison. Potvin loves to share stories of her grandchildren with clients and has brought them in several times. She’s frequently described as a very “humble” person by clients and staff alike, and is missed when she’s not there. Carefor Carling Adult Day Program is funded partially by the Ministry of Health, with client fees, and donations. 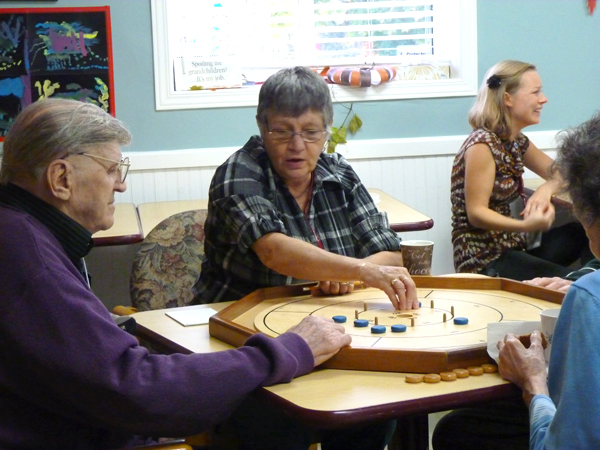 Francophone programs are offered every Tuesday at the Carling Adult Day Program. To contact Carefor Adult Day Program on Carling Avenue go to carefor.ca or call 613-721-6496. Referrals can also be arranged through CCAC at 613-745-5525.